Horizon: Zero Dawn launched last week worldwide. The PlayStation 4 exclusive action roleplaying game garnered a very positive reception among both gamers and press (we’ll have our own review on the site shortly). 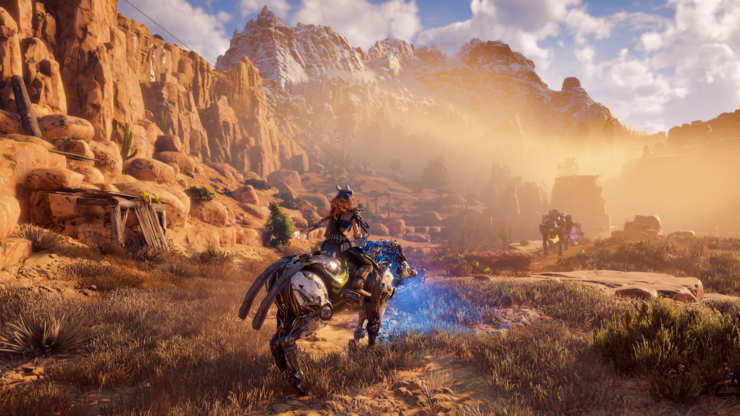 Guerrilla’s Game Director on Horizon: Zero Dawn, Mathijs de Jonge, shared some interesting data. Apparently, players have killed 152 million Watchers, 1.4 million Thunderjaws and 20 million turkeys so far. Mathijs de Jonge also confirmed that there were guns in Horizon Zero Dawn during early development (which makes sense, considering Guerrilla’s first-person shooter heritage with Killzone), but they were eventually removed as they did not fit the game’s overall theme. early on in development we had some in, but soon replaced them as they didn't feel right for the game. We’ve just published our review of Horizon Zero Dawn. Chris rated the game 9.5/10 with the following summary, and I’m inclined to agree with him for what I’ve seen so far in my playthrough. Horizon Zero Dawn is a pure sign of what can be completed with an exceptionally designed open world. Not only that, it has exceptional characterisation and a sincere story that doesn’t shoehorn elements, allowing for the organic growth of characters. This is a game that I can barely find any faults with, except borrowing some elements from other open world games. Even so, it made each and every element its own in one of the best games to date. With the game’s universal praise of gamers and critics, a sequel is all but guaranteed. However, the real question right now is whether or not Guerrilla will release story expansions via DLC. Bethesda and CD Projekt RED proved that this is a perfectly viable way to provide more content to fans while preparation on the next game begins inside the studio. Stay tuned on Wccftech – we’ll make sure to report any DLC news for Horizon Zero Dawn as soon as it happens. In the meantime, de Jonge also said that the team is “looking into” making the pre-order DLC Nora Machine Trapper Bonus, Nora Lookout Outfit, Nora Longshot Bow) available for purchase separately on the PlayStation Store.